Smagghe & Cross - MA. Vinyl LP. Bleep. Vladimir Ivkovic’s record label Offen Music has managed to put together an impressive array of releases already in relatively small space of time. 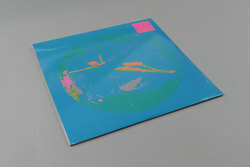 Mostly dealing with close-knit music circles the esteemed selector is connected to; this latest release is no exception. Offen005 collects 9 tracks from Ivan Smagghe and Rupert Cross, a series of abstract electronic works, noise laden kraut inspired jams and ear-wiggling leftfield club tracks. Spread across a double LP, the guitar stylings of Tim Felton appear on three separate tracks and bring to mind G.B. Becker’s amazing Walkman album. Slightly different from the usual, slightly darker vibe of previous Offen releases but every bit as solid!